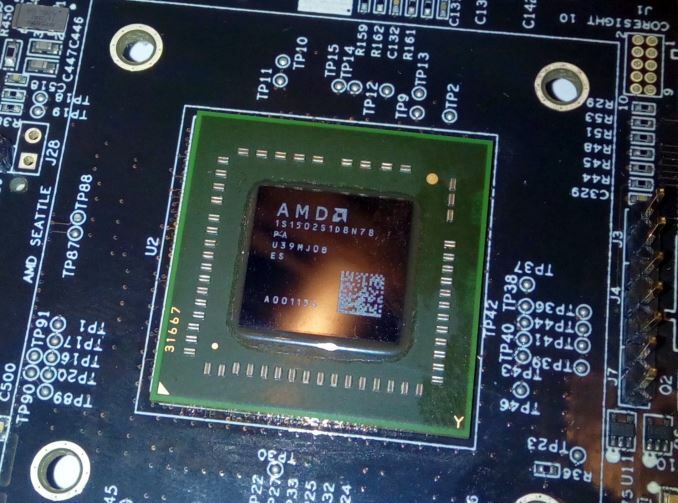 AMD announced their ARM server SoC plans at the end of 2012. At the beginning of 2014, AMD was ready "to accelerate the ARM Server Ecosystem with the first ARM-based server SoC" with a development kit. Around March 2014, the A1100 SoCs started sampling. But the quad core dev kits were not only expensive ($3000! ), they also had quite a bit of teething problems as performance did not meet expectations, some of the peripheral hardware did not work properly, and the software ecosystem was far from ready. We were expecting to see Opteron A1100 based servers at the end of 2014, but instead we got more than a year of almost complete silence. Frustratingly long for anyone who was hoping that AMD would finally bring something competitive to the server world. Today, AMD is finally announcing that their Octal core Opteron A1100 server SoC and platform is fully ready as "a right sized option for the edge of the datacenter". A few smaller partners are even shipping it. but there is no sign of tier 1 OEMs yet. Most people following this part of the semiconductor part are thinking "too little, too late". We are pretty sure that includes you, dear reader. But there is more than meets the eye or we would not bother to write this article. AMD is launching 3 SKUs and the spec table is available below. From the early reports, performance is somewhere between 80 to 90% of the Atom C2750 (Eight 2.4 GHz Silvermont cores at 2.4-2.6 GHz). Even if AMD has used the delay to tune the A1100 significantly, it is very unlikely that the chip will be able to beat the Atom chip by any tangible margin. The performance per watt ratio of the 28 nm ARM Opteron is not stunning either: a TDP of 32W at 2 GHz is worse than the 20W that the 22 nm C2750 needs at 2.4 GHz. Of course, TDP is one thing, the real power consumption at low and medium loads is more important for a server SoC. Nevertheless, we were promised an octal core at Atom C2750 levels at 25W TDP. And last but not least, the Atom has been available for more than 2 years now. Its successor, Denverton - or the 14 nm Atom C3xxx - should arrive in the second half of 2016. But Intel is late too, as Denverton was also supposed to be in the market by early 2015. Contrary to AMD however, is Intel executing very well in all other server markets. With the much less than hyped/predicted growth of the microserver market, it is only natural that Intel prioritize other products in its datacenter portefolio. Overall the A1100's 32W TDP looks high and performance expectations are low, so why bother? Pricing perhaps? Unfortunately the answer to that will be "no," as AMD told us that the initial price of the A1170 SoC will be $150. That is the same price of the Atom C2730 (eight cores at 1.7 GHz), which will probably perform at the same level, but the Intel chip is a 12W TDP chip. At $150 the A1100 even comes dangerously close to the quad core, 8 thread Xeon D-1520 at 2.2 GHz ($199). 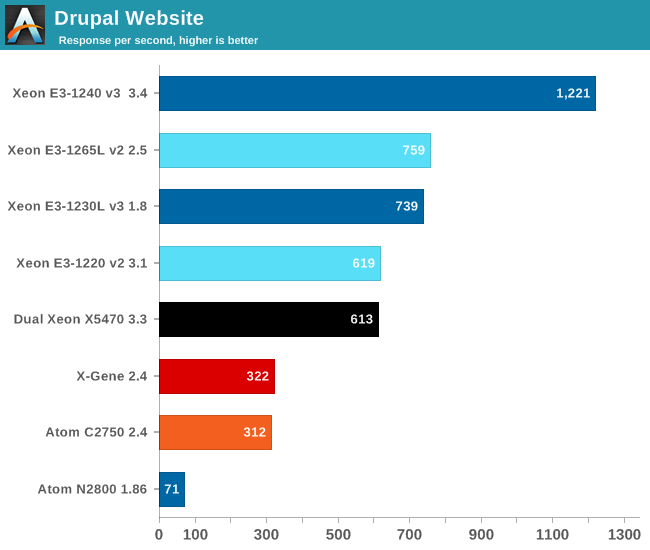 Do not let the 4-cores fool you, we found that the octal core (16 thread) Xeon D-1540 is no less than 5.5 times faster than an Atom C2750 in real server workloads. Take a look below. The A1100 will probably score around 300, the Xeon D-1520 will probably score beyond 600. So an Xeon D-1520 will still be at least twice as fast as an Atom C2750 or Opteron A1100. So the new AMD SoC has no performance/watt advantage and no price/performance advantage over Intel's offerings.